Yahya Jammeh was the President of Gambia since 1994, when he, together with a group of young officers of the Gambian National Army, seized power from the former president in a military coup. In 2016 he lost the elections against Adama Barrow, although he initially conceded defeat, he later refused to step down as president of Gambia. He claimed that voter fraud had cost him the election. Early January 2017, tens of thousands of Gambians fled to neighbouring countries and tourists returned home as troops from Nigeria and Senegal were preparing to invade the country to remove Jammeh from the state house. Eventually Jammeh gave up and left the country in a cargo plain with a dozen of valuable cars, leaving the vault of the Central Bank almost empty. Almost, that is because the special collectors coins that were minted in 2016 were left behind. Even although dictator Jammeh is now gone, the Central Bank of Gambia is planning to issue the coins in April 2017 as the costs of the minting were too high to ignore. 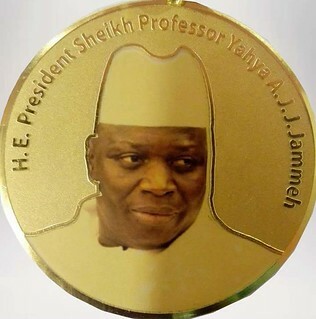 It is probably these coins that were mentioned in the testimonies before the Janneh Commission investigating financial dealings of the the former president Jammeh. Both pages added to the Web Archive. Well possible. Unfortunately very few is known about this coin. The image and information were at the time obtained from an employee of the BBC.